"Victory coin" of Alexander the Great, minted in Babylon c.322 BCE, following his campaigns in the subcontinent. In ancient times, trade between the Indian subcontinent and Greece flourished with silk, spices and gold being traded. The Greeks invaded India several times, starting with the conquest of Alexander the Great. Bacchus/ Dionysus returning from India. A legendary account states that when the Greek God Bacchus/Dionysus grew up, he discovered the culture of the vine and the mode of extracting its precious juice, being the first to do so; but Hera struck him with madness, and drove him forth a wanderer through various parts of the earth. In Phrygia the goddess Cybele, better known to the Greeks as Rhea, cured him and taught him her religious rites, and he set out on a progress through Asia teaching the people the cultivation of the vine. The most famous part of his wanderings is his expedition to India, which is said to have lasted several years. According to a legend, when Alexander the Great reached a city called Nysa near the Indus river, the locals said that their city was founded by Dionysus in the distant past and their city was dedicated to the god Dionysus. These travels took something of the form of military conquests; according to Diodorus Siculus he conquered the whole world except for Britain and Ethiopia. Returning in triumph (he was considered the founder of the triumphal procession) he undertook to introduce his worship into Greece, but was opposed by some princes who dreaded its introduction on account of the disorders and madness it brought with it (e.g. Pentheus or Lycurgus). Campaigns and landmarks of Alexander's invasion of India. 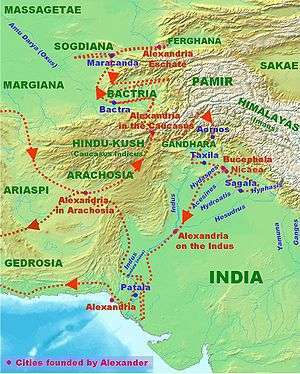 In 327 BC Alexander the Great began his foray into Punjab. King Ambhi, ruler of Taxila, surrendered the city to Alexander. Many people had fled to a high fortress/rock called Aornos. Aornos was taken by Alexander by storm after a successful siege. Alexander fought an epic battle against the Indian monarch Porus in the Battle of Hydaspes (326). After victory, Alexander made an alliance with Porus and appointed him as satrap of his own kingdom. Alexander continued to conquer all the headwaters of the Indus River. East of Porus' kingdom, near the Ganges River, was the powerful kingdom of Magadha, under the Nanda Dynasty. --Plutarch, Parallel Lives, "Life of Alexander"
Exhausted and frightened by the prospect of facing another giant Indian army at the Ganges River, his army mutinied at the Hyphasis (modern Beas), refusing to march further East. Alexander, after the meeting with his officer Coenus, was convinced that it was better to return. Alexander was forced to turn south, conquering his way down the Indus to the Arabian Sea. He sent much of his army to Carmania (modern southern Iran) with his general Craterus, and commissioned a fleet to explore the Persian Gulf shore under his admiral Nearchus, while he led the rest of his forces back to Persia by the southern route through the Gedrosia (modern Makran in southern Pakistan). Hellenistic satrapies in India after Alexander. Alexander left behind Greek forces which established themselves in the city of Taxila, now in Pakistan. Several generals, such as Eudemus and Peithon governed the newly established province until around 316 BC. One of them, Sophytes (305–294 BC), was an independent Greek prince in the Punjab. With the help of these elements from Central Asia, Chandragupta was apparently able to defeat the Nanda/Nandin rulers of Magadha so as to found the powerful Maurya empire in northern India. 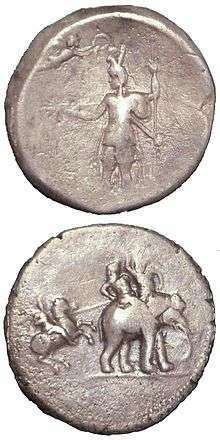 Tetradrachm of Seleucus from Seleucia. Obverse: the head of Zeus, Reverse: Athena with elephants. Seleucus I Nicator, founder of the Seleucid dynasty and one of Alexander's former generals, invaded what is now Punjab in northern India and Pakistan in 305 BC. Details of Seleucus's conflict with Chandragupta Maurya are lacking but Chandragupta had the best of it. Chandragupta and Seleucus finally concluded an alliance. Seleucus gave him his daughter in marriage, ceded the territories of Arachosia, and received from Chandraguta 500 war elephant which he used decisively at the Battle of Ipsus. Seleucus also sent an ambassador named Megasthenes to Chandragupta's court, who repeatedly visited Chandragupta's capital of Pataliputra (modern Patna in Bihar state). Megasthenes wrote detailed descriptions of India and Chandragupta's reign. Continued diplomatic exchanges and good relations are between the Seleucids and the Mauryan emperors are then documented throughout the duration of the Mauryan empire. The founder of the Indo-Greek Kingdom Demetrius I (205–171 BC), wearing the scalp of an elephant, symbol of his conquests in India. 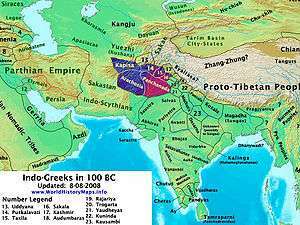 In 180 BC, the Indo-Greeks, invaded parts of northwest and northern India and ruled in the Punjab region. They are an extension of the Greco-Bactrian dynasty of Greek kings (the Euthydemids) located in neighbouring Bactria. The invasion of northern India followed the destruction of the Mauryan dynasty by the general Pushyamitra Shunga, who then founded the new Indian Shunga dynasty (185 BC-78 BC). The Indo-Greek king Menander may have campaigned as far as the capital Pataliputra in eastern India (today Patna): "Those who came after Alexander went to the Ganges and Pataliputra" (Strabo, XV.698 ). The Indo-Greeks ruled various parts of northwestern India until the end of the 1st century BC, when they were conquered by the Scythians and Kushans. Buddhism flourished under the Indo-Greeks, leading to the Greco-Buddhist cultural syncretism. The arts of the Indian sub-continent were also quite affected by Hellenistic art during and after these interactions. Bull, Malcolm, The Mirror of the Gods, How Renaissance Artists Rediscovered the Pagan Gods, Oxford UP, 2005, ISBN 9780195219234 Dalby, Andrew (2005). The Story of Bacchus. London: British Museum Press. ISBN 0-7141-2255-6.